Myomectomy remains the surgical option of choice for women with symptomatic leiomyomata who desire uterine conservation or in particular future fertility. The ability to enucleate leiomyomata and repair the uterus with a multilayer-sutured closure is both crucial and technically challenging. Advanced gynecologic pathology and the surgical limitations of conventional laparoscopy have often been cited as impediments to not only these critical steps but also to converting a myomectomy from a procedure predominantly performed by laparotomy to one accomplished by laparoscopy. Recently, the use of robotic technology as a means to facilitate the laparoscopic completion of a myomectomy was introduced. Advantages to this approach have been the improved dexterity and precision of the instruments coupled with three-dimensional imaging. Published preliminary data have shown the feasibility and safety to this approach. This paper will outline a safe and efficient surgical technique for completing a robot-assisted laparoscopic myomectomy with the da Vinci® surgical system. Leiomyomata are the most common pelvic tumor in women. These benign tumors of fibrous tissue and smooth muscle are often implicated in excessive bleeding, pain, pressure, and/or infertility. Although newer modalities such as uterine artery embolization exist, myomectomy remains the surgical option of choice for women desiring uterine conservation or in particular future fertility [1, 2]. 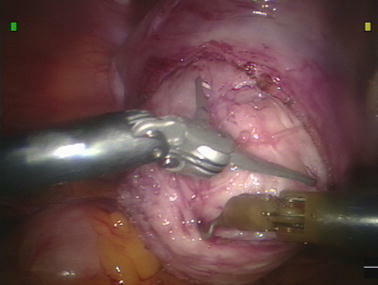 As a result of the advent of modern-day minimally invasive surgery techniques, many cases of intramural and subserous leiomyomata are managed by laparoscopy today. Despite the increasing acceptance of laparoscopy, laparotomy still remains the primary route of conservative surgical management for symptomatic leiomyomata, not approachable by hysteroscopy. There is no doubt that the management of leiomyomata endoscopically is one of the more challenging procedures in minimally invasive surgery and requires a skilled surgeon. The ability to enucleate leiomyomata and repair the uterus with a multilayer-sutured closure is both crucial and technically challenging. These issues are thought to affect conversion rates to laparotomy and may play a role in cases of uterine rupture. Much of the steadfast adherence to the open approach has been due to the difficulties encountered with conventional laparoscopy and its associated learning curves [3, 4]. The use of robot-assisted technology may provide a means to overcome the challenges encountered with hysterotomy, enucleation, repair, and extraction that are seen with conventional laparoscopic management of leiomyomata. In other words, the use of computer-assisted surgery may provide surgeons with improved dexterity and precision coupled with advanced imaging and allow the endoscopic approach to be more accurately modeled after open surgical techniques. The following paper will describe the use of the da Vinci® surgical system (Intuitive Surgical®), which is the only Food and Drug Administration (FDA)-approved robotic device for use in gynecologic surgery as of April 2005. The focus will be on both surgical technique and instrumentation. The da Vinci® surgical system is a laparoscopic assist device that is comprised of three components that exists as core technology within two platforms, the Standard and S™ systems. The first component is the surgeon console, which is located remotely, several feet from the patient bedside. In theory, this can also be located in an adjoining room. The surgeon seated at this console is able to control robot-assisted instruments, a camera, and an energy source within the patient with the aide of a stereoscopic viewer, hand manipulators and foot pedals. The second component of the da Vinci® surgical system is the InSite® Vision System, which provides three-dimensional imaging through a 12 mm endoscope. A 5 mm endoscope is also available; however, this only provides two-dimensional imaging therefore these authors typically incorporate a 12 mm endoscope. The third component of the da Vinci® surgical system is the patient-side cart with robotic arms and EndoWrist® instruments. Currently the system is available with either three or four robotic arms. One of the arms holds the endoscope while the other two to three arms hold the various EndoWrist® instruments, which come in either 8 or 5 mm sizes. The EndoWrist® instruments are unique in that they lack haptic or tactile feedback for the surgeon operating them at the console. They do however possess a wrist-like mechanism that allows seven degrees of movement, thereby replicating the full range of motion of the surgeon’s hand. This in turn eliminates the fulcrum effect seen with conventional laparoscopy. A series of EndoWrist® instruments, such as needle drivers, scissors, and graspers can be interchanged on either of the lateral robotic arms. Patient positioning is analogous to conventional laparoscopy. All patients are placed in low dorsal lithotomy position with arms padded and tucked at their sides after general endotracheal anesthesia is administered. Anti-skid measures should be incorporated at this time with either the proper use of shoulder braces or a foam egg-crate mattress directly behind the patient’s upper back in order to avoid patient slippage during the use of Trendelenburg. An examination under anesthesia is performed prior to the patient being prepped and draped in order to plan trocar placement. The bladder is drained with a Foley catheter and the stomach is evacuated with an orogastric tube. Pre-operatively, patients should have undergone a mechanical bowel prep in order to adequately decompress the distal colon and rectosigmoid for improved visualization of the pelvis as well as minimize any risk of injury. Based on surgeon preference, a variety of uterine manipulators can then be placed in order to facilitate the robot-assisted myomectomy. These authors utilize a ZUMI® uterine manipulator (Cooper Surgical®, Trumbull, CT, USA) (Fig. 1). Pneumoperitoneum is obtained with a Veress needle technique followed by placement of either four or five trocars, depending on whether or not the patient-side cart has three or four robotic arms. These authors utilize a three-armed patient-side cart with the accessory port placed on the patient’s right side (Fig. 2). A 12 mm port is placed either at or above the umbilicus depending on the size of the uterus. This port accommodates the endoscope which provides the three-dimensional imaging. As a general rule, at least a hands-breadth distance or approximately 8–10 cm between the endoscope and top of an elevated uterus or leiomyoma during manipulation is necessary in order to allow for an adequate working distance between the endoscope and the uterine fundus. This is a critical concept during myomectomy because the enucleation process will result in the leiomyoma telescoping out toward the endoscope. This loss of optical working distance must be compensated for at the beginning of the case or else instrument maneuverability will be compromised. Two 8 mm ports that mount directly to the operating arms on the patient-side cart are placed in the left and right lower quadrants, respectively. For larger uteri or leiomyomata, these ports are moved more cephalad. A fourth trocar serves as an accessory port and can be placed between the camera port and either the left or right lower quadrant ports. This is typically a 12–15 mm port in order to facilitate introduction of suture as well as instruments used for retraction, suction/irrigation, and specimen removal via a tissue morcellator. An alternative placement for this large accessory port is in either the left or right lower quadrant. The respective 8 mm robotic trocar can then be telescoped through the accessory port without loss of pneumoperitoneum. A smaller trocar can then be used in the traditional accessory port location. Once all desired ports are in place, the patient is placed in steep Trendelenburg. The patient-side cart with robotic arms is brought between the patient’s legs and docked. This means that each port is attached to the assigned robotic arm with the exception of the accessory port. The bedside surgeon is responsible for EndoWrist® instrument exchanges and management of any accessory port activity such as providing suction/irrigation. At this point, the anesthesiologist must be notified that the operating room table cannot be moved unless the patient side-cart is undocked. A variety of EndoWrist® instruments are available for use during a myomectomy. Although traditional surgical instrumentation such as DeBakey forceps and curved scissors are available on this platform, newer multifunctional EndoWrist® instruments such as the bipolar PK™ dissecting forceps, hot shears (monopolar curved shears), tenaculum and mega needle driver allow for safe and efficient completion of a myomectomy with minimal instrument exchanges (Fig. 3). Advantages of newer energy sources such as the bipolar PK™ dissecting forceps are its ability to facilitate the enucleation process while providing active feedback control over the power output being applied. The use of this particular instrument does require integration with a Gyrus ACMI generator that incorporates PlasmaKinetic (PK) vapor pulse coagulation (VPC). This results in improved hemostasis with minimal thermal spread, tissue sticking, and heating of the instrument. 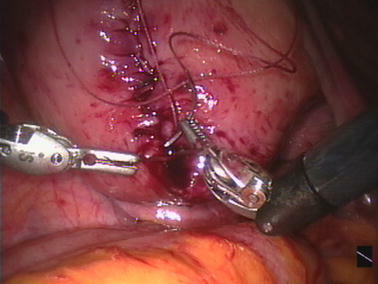 An approach that is modeled after open surgical technique is critical to the success of a robot-assisted laparoscopic approach to myomectomy. Determining the size and location of leiomyomata pre-operatively is also important. The authors recommend that all patients undergo appropriate radiologic imaging prior to myomectomy. Although ultrasound is diagnostic in the majority of cases, it has been the bias of the authors to utilize magnetic resonance imaging (MRI) in all patients prior to surgery in order to assess the size, number, and location of leiomyomata as well as rule out adenomyosis. This information also allows for a strategic uterine incision or hysterotomy to be performed. Intra-operatively after the location of the leiomyoma to be removed is assessed, a dilute concentration of vasopressin is injected into the myometrium surrounding the myoma, as an adjunct for hemostasis (Fig. 4). This is facilitated by a 7 in. 22 gauge spinal needle placed directly through the anterior abdominal wall. The use of vasopressin, pneumoperitoneum, and the judicious use of electrosurgery all contribute to hemostasis and adequate visualization during the procedure. Each case is begun with bipolar PK™ dissecting forceps or a non-energized Cadiere forceps® on the left arm and hot shears or a permanent cautery hook (both monopolar devices) on the right arm. This designation can be varied based on surgeon preference. It is important to note that the monopolar current provided to the hot shears is in coagulation mode therefore the power settings on the radio-frequency generator are typically kept to a minimum of 35 in order to avoid the risks of excessive energy delivery. Factory default settings on the Gyrus ACMI generator are used for the PK™ dissecting forceps. 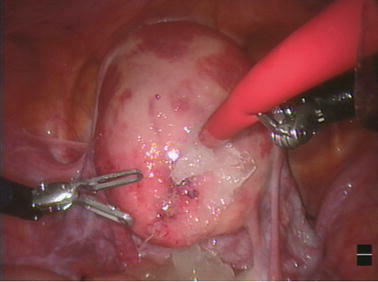 Once adequate blanching of the myometrium surrounding the leiomyoma is noted, a hysterotomy is made with a monopolar device (Fig. 5). 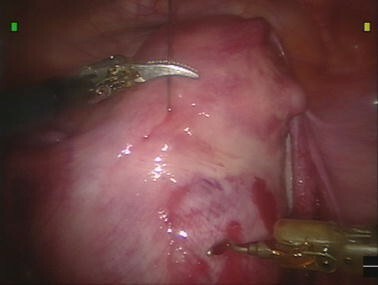 Although this incision is typically done horizontally in a conventional laparoscopic case in order to facilitate suturing, with the robot-assist device, the hysterotomy can be made in a longitudinal axis (as would otherwise be done in an open myomectomy) as the surgeon is less limited in terms of manual dexterity for the suturing process. Once the leiomyoma capsule is identified and the appropriate plane is found, the tumor is enucleated utilizing a monopolar device on one arm and a grasping instrument on the other. Additional traction/counter-traction on the leiomyoma can be provided by the bedside assistant with a conventional laparoscopic tenaculum or corkscrew. If a fourth arm is present, then an EndoWrist® tenaculum can be utilized (Fig. 6). Careful attention to hemostasis should be paid throughout this portion of the procedure, particularly as the base of the leiomyoma is encountered. Excessive traction can prematurely avulse the tumor and result in bleeding. The hysterotomy incision can be enlarged as needed in order to facilitate the enucleation process. After removal of the leiomyoma is complete, it is placed in the posterior cul-de-sac for retrieval at the end of the case. Larger specimens can be placed in one of the paracolic gutters. Typically the EndoWrist® instruments are exchanged for both a large needle driver on the left arm and a mega needle driver on the right arm. The mega needle driver, with its high-force grip, minimizes needle movement during passage through the thick myometrium and facilitates closure of the defect. The deep layers of the myomectomy incision are then repaired in a multilayer fashion. Either interrupted sutures of 0-Vicryl™ on CT-2 needles cut to six inches or running sutures of 0-Vicryl™ on CT-2 needles cut to 11 inches can be used. Suture passage and exchange are managed through the accessory port by the bedside assistant. The increased articulation and dexterity of the EndoWrist® instruments facilitates intracorporeal suturing and closure of the uterine defect regardless of incision orientation. Once the deep layers of the myometrium are reapproximated, the uterine serosa is closed with a running baseball stitch that utilizes 3-0-Vicryl™ on an SH needle (Fig. 7). At this point, there are several noteworthy points. If multiple leiomyomas are to be removed, it is the preference of the authors to repair each uterine defect after enucleation of a leiomyoma before moving on to another tumor in order to take advantage of the effects of the vasopressin at that site. Maximizing the number of leiomyomas extracted through a given hysterotomy is advisable and decreases the number of uterine incisions. Finally, whether single or multiple, specimens are retrieved at the end of the case, again, in order to take advantage of the effects of the vasopressin and minimize blood loss from an unrepaired uterine incision. Careful attention should be paid to keeping an accurate count of the number of leiomyoma enucleated and if need be they should be tagged with long suture in order to avoid loss within the abdominal cavity. This is recommended for smaller specimens. Prior to extraction of leiomyomata from the abdomen, the robot-assist device is undocked. Specimen retrieval is accomplished with the use of a serrated–edge tissue morcellator (WISAP®) that is placed through the accessory port (Fig. 8). Next, all operative sites are irrigated and a low insufflation pressure check is performed to ensure hemostasis. Once hemostasis is confirmed, an adhesion barrier is placed over all uterine incisions [5, 6]. The authors typically employ a slurry of finely chopped Seprafilm® (Genzyme®) in 35 cc of normal saline. 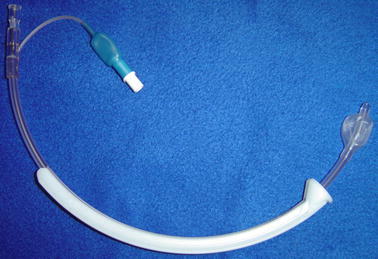 This is introduced through one of the trocars via a red rubber catheter and 60 ml catheter tip syringe (Fig. 9). All instruments are then removed from the patient’s abdomen and pneumoperitoneum released. Port sites are closed accordingly. 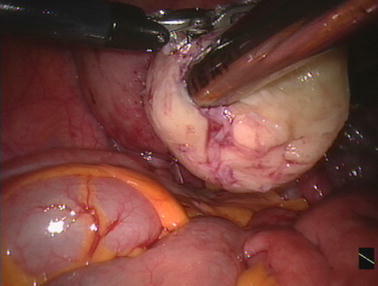 Based on the described surgical technique, a myomectomy that adheres to open surgical principles can be accomplished with the aide of a laparoscopic assist device such as the da Vinci® surgical system. This approach to robot-assisted laparoscopic myomectomy has been used successfully by the authors for the past five years . Critical to the success of this technique has been a thorough understanding of all facets of robotic instrumentation including its limitations. 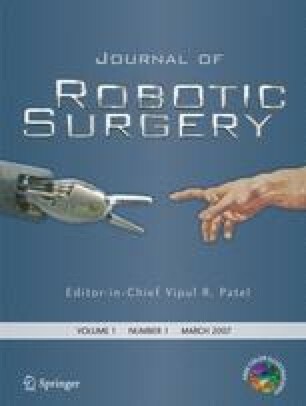 Although an absence of haptic or tactile feedback may be viewed as a limitation during a robot-assisted laparoscopic myomectomy, the authors find that both the improved visualization and instrument dexterity in this approach overcome any difficulties that may be encountered with the dissection. 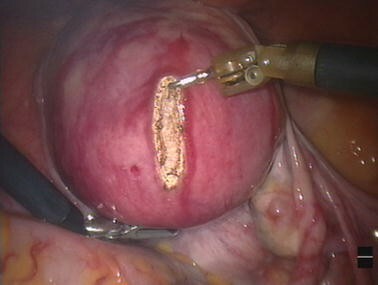 This is by no means the only way to perform a robot-assisted laparoscopic myomectomy but represents a safe and efficient way of approaching a common gynecologic problem.